In 2015, an average of 13 workers died on the job every single day. With the American workforce spending almost 50% of their waking hours at work, worker safety is of paramount importance. According to data provided by the Occupational Safety and Health Administration, workplace illnesses and injuries cost employers almost $1 billion per week in direct compensation costs. With the advent of drone technology and advanced data analytics software platforms, businesses across industries are progressively turning to aerial insights to keep illnesses and injuries at bay. As National Safety Month comes to an end, let’s take a look at some of the seamless ways companies across a multitude of verticals are sending in drones to eliminate or reduce occupational risks to an acceptable level. In highly hazardous workflows that require constant manual inspections, drones prove to be safer and more effective at carrying out tasks that put employees at risk. In construction, for example, drones offer the ability to fast-track and automate core tasks (e.g. site surveys, scaffolding inspections, asset management, project management) that are usually risky and time-consuming. The Occupational Safety and Health Administration has cited Construction’s “Fatal Four”, detailing the four events leading to the highest number of worker deaths in the industry -- these include: falls, struck by object, electrocution, and caught-in/between. Occupational safety consultant, Barton Jones, thinks drones eliminate the risk of “fatal four” events in the job site, “Construction is the most hazardous industry. Falls at construction sites, falls from heights, from cellphone towers, while doing scaffolding inspections, falls from ladders, roofs and open sided edges are the number one reason people get hurt badly or even die. Statistically it represents 35% of construction fatalities. 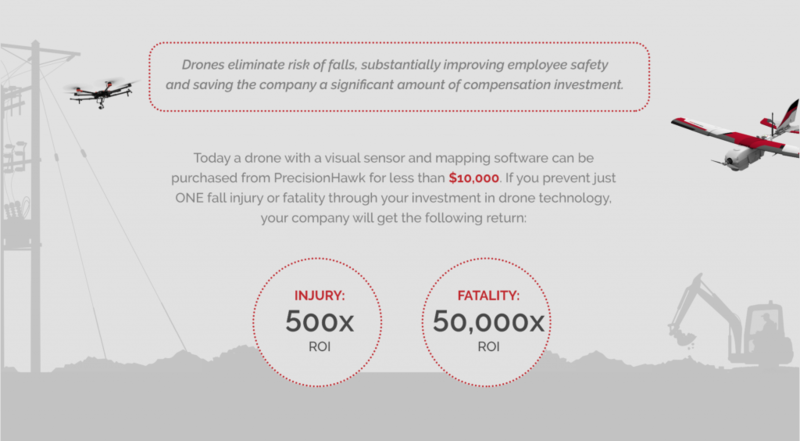 By using drones the exposure of falls can be eliminated.” For more on how end-to-end drone data platforms are making job sites safer, check out this comprehensive infographic we put together for the first annual OSHA Safe + Sound week. In 2014, PrecisionHawk worked with the Environmental Protection Agency to map an industrial landfill in South Carolina that released asbestos and other toxic particulates into the air. Ground surveyors needed an accurate volumetric survey of the area, but an active fire that affected subsections of the landfill made it largely impossible and unsafe to gather this data. To help the EPA assess the full magnitude of the situation and create a strategic action plan, PrecisionHawk flew a drone to create a 3D reconstruction of the entire area of interest, allowing ground responders to gain a more accurate spatial understanding of the site. The drone survey took less than an hour to carry out, dramatically reducing the risk for ground responders. Traditionally, it would take them days or weeks to walk the landfill, ultimately prolonging exposure to chemicals that are detrimental to their health. Drones and advanced data analytics introduce an increased level of operational efficiency and worker safety to the energy sector. Linemen/power workers have some of the most dangerous jobs in the United States (accounting for a total of 26 fatalities in 2012). Drones eliminate most of the risks involved by taking human interaction with high-voltage power lines out of the equation. In 2016, PrecisionHawk partnered with the Sacramento Municipal Utility District to safely and cost-effectively leverage drone data to monitor and analyze over 500 miles of power lines. The aerial survey helped accurately determine the clearance space between vegetation and transmission lines to reduce chances of outages, enhance reliability, and also aid in fire protection and prevention efforts. 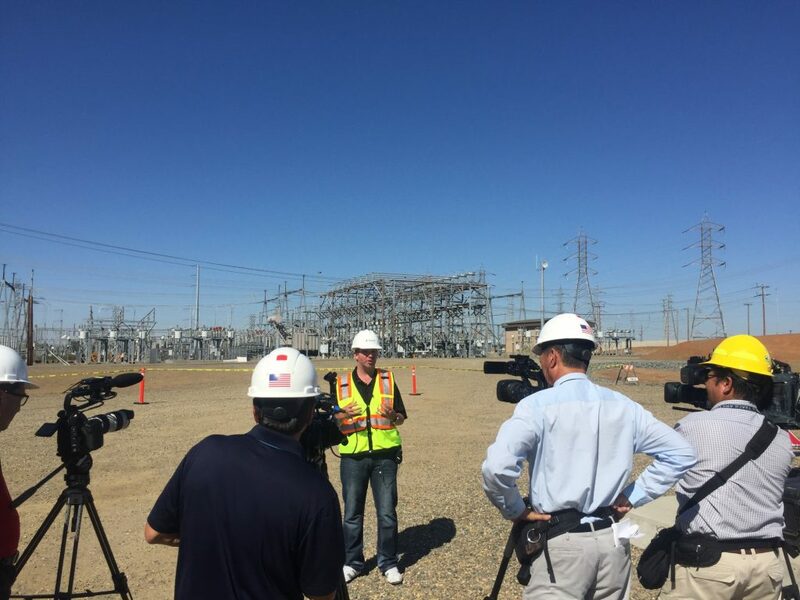 Without drone technology, an SMUD vegetation manager would have had to foot patrol all 500 miles of high-voltage power lines, a task that would have taken them weeks to accomplish and expose them to more occupational risks. By using drones equipped with multispectral and high definition visual cameras, the team was able to safely gather actionable insights in a matter of hours. Disaster management protocols take into consideration a myriad of factors that mostly focus on survivor safety. Often times, first responders are thrown in the line of fire under the toughest working conditions. In the case of earthquakes, landslides, hurricanes and wildfires, first responders are deployed immediately in rough and dangerous terrains. In 2014, for example, a mudslide roared through the rural community of Oso, Washington, destroying over 30 homes and taking the lives of 43 residents. PrecisionHawk was called out to provide geologists and first-responders with a 3D map of the entire affected area, helping them gain a better understanding of the terrain. PrecisionHawk used high fidelity sensors and intelligent data analytics software to reconstruct and analyze the disaster zone in 3D -- a step that not only helped geologists detect the pace of land movement but also provided first responders the time-sensitive data they needed to infiltrate the scene without putting themselves in harm’s way. To put safety first, maximize efficiency and cut costs, start deploying drone data solutions by reaching out to us at info@precisionhawk.com. Already a drone owner? Sign up for a free PrecisionMapper account today and empower your surveys with automated data analysis tools.